"Save the BBC's recipe archive!" is the cry from more than 100,000 people who have reacted with anger and confusion at plans to close the BBC Food website. The petition was created by Emma Barrington, from London, a week ago after seeing news on social media about the proposals. 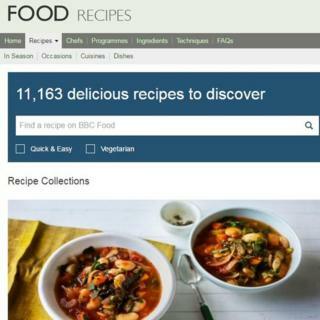 All existing recipes on The BBC Food website - more than 11,000 of them - will be archived, although the commercial BBC Good Food website will remain. She says she is overwhelmed by the support. "In the last few hours, the petition has gone completely mad. "I was outraged about losing BBC recipes. It felt ridiculous and pointless. "It's heart-warming and overwhelming though that so many people feel the way I do," she said. "I access the recipes frequently, partly because it's one of the first things that appears when you search for a dish. "It's great for the whole family. I use it to cook with my children too." When the BBC announced it would be slimming down its online content, home cooks took to Twitter and Facebook declaring it was a decision they could not stomach. Within hours, #bbcrecipes was trending on Twitter, with about 10,500 tweets posted in the first six hours. Aliya Ram tweeted: "Seriously what am I supposed to eat if the BBC gets rid of its recipes? "Today will consist of writing out every single one of the #bbcrecipes so I have a record of them & I don't eat beans/toast until I'm 70," tweeted Olivia Grace. Ashley Fryer tweeted: "How can they justify taking down #bbcrecipes. It's free and accessible and mostly completely delicious. There's no comparison." Many asked how cutting out the recipes from the website would help the corporation save money, as others shared their tried and tested dishes. As the social media meltdown continued, the BBC issued a clarification that recipes would be archived and eventually mothballed, and some recipes could still be accessed using specific URLs. It also added: "BBC Good Food is the UK's leading food website and is not affected by the BBC's review. All our recipes are still available for free." But the social media outrage continues to grow. "Get saving those BBC recipes you love-they'll be gone soon," tweeted Laura Owen. Simon Moores tweeted a picture of his dog looking concerned over the news:"#politicaldog deeply worried that after the #bbcrecipe cuts will come the cream cakes." However, not everyone shared the same enthusiasm. Richard Stagg tweeted: "I'm not too fussed about #bbbrecipes closing. The microwave instructions are right there on the side of the macaroni cheese packet."